I love animals...they're delicious. I actually do love animals, and cute children, and I can even go for the cute love story. I am going to imagine that We Bought A Zoo, the film version of Benjamin Mee's non-fiction book, is on the whole close to the source material (and close to the truth). Be that as it may, Cameron Crowe's latest effort goes by the numbers, from Plot Point A to Plot Point Z in a nice and gentle way that will please those that want familiarity and predictability. Benjamin Mee (Matt Damon) is a recent widower with two children: 14-year-old Dylan (Colin Ford) and 7-year-old Rosie (Maggie Elizabeth Jones). As one can expect, the ladies are all eyeing the newest catch (lots of lasagna plates) and Dylan is 'troubled'. "Troubled" enough that in order to make a new start, Benjamin quits his newspaper job and decides to start out in a new home. With Rosie's help, they find what appears to be a perfect home, but with one catch: it's a literal zoo. The house and property is a wildlife park that opens to the public in the summer. He decides that it is worth the asking price, and with the zoo staff, headed by Kelly (Scarlett Johansson), make all the necessary repairs and restorations to pass inspection. The staff is a quirky lot, primarily the almost always drunk Scotsman MacCready (Angus Macfadyen). Rosie is thrilled to be surrounded by all the animals, but Colin hates it there, even if Kelly's niece Lilly (Elle Fanning) is obviously infatuated with Colin (side note: I've had one or two of those infatuations, and they can be a bit spooky, so I can relate, only his infatuation appeared to be sane, but I digress). The repairs, improvements, feeding of the animals and paying of staff is a pretty penny fast burning through Mee's accounts. His older brother Duncan (Thomas Haden Church) thinks the whole thing is bonkers, and bookkeeper Rhoda (Carla Gallo) soon gets the staff against him because he has no money. Don't be surprised that money comes to him magically via his dead wife (gotta love those Deus Ex Machinas). All this is backdrop to Benjamin's continuing struggle to get over the death of his wife, his struggles with his son (who is going through his own brand of mourning), and the dreaded Inspector Javert...I mean Ferris (John Michael Higgins). Ferris is not a fan of anyone, a petty bureaucrat who delights in frightening the staff, and whom MacCready so despises he has to be at one point locked in a room to stop them from meeting. Eventually father and son see how much they love each other, Kelly and Benjamin see how much they love each other, Duncan sees how much his brother was right, and all is well. Again, I figure that since We Bought A Zoo is based on Mee's memoirs, a lot of what occurred happened. I figure Crowe and fellow screenwriter Aline Brosh McKenna changed a few things, so the fact that I have never read (or until the movie, heard of) the book shouldn't prejudice me against the film. 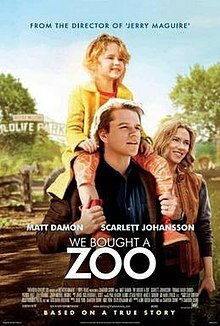 However, as I watched We Bought A Zoo, I kept finding that the film was amazingly predictable in where the plot was going. It wasn't just that one excepted the widower was going to be pursued by almost every woman he met (which makes me wonder if what I need is a wife in order to get a girlfriend), that the male and female leads to eventually find they were in love, that there was going to be at least ONE complication at the Big Inspection, that the son was going to be angry and the cute little girl precious and adorable. It was that there were one or two things that We Bought A Zoo didn't quite answer. How Mee solves his financial situation is a curious thing. As the single greatest character in River Song (formerly known as Doctor Who) would say, "SPOILERS". He's just about out of money, but he suddenly discovers that his wife has had a secret account she'd been saving up for her family because she knew she was dying. The proof of this is in the pocket of the hoodie Mee simply cannot part with, which he slipped on that one time to remember his wife. I was not only troubled at just how easily Mee's financial problems were resolved (far too cinematic), but in retrospect I kept thinking how in all the time he had the hoodie he never once sensed the paper detailing her secret account inside the pocket. Morevoer, does it strike anyone else as mean that Mrs. Mee never mentioned this secret account? Yes, I'm aware that she was dying (I think it was cancer), but couldn't she have left instructions or even a message to be read upon her death mentioning over $80,000? I also fault Crowe for making what I think was a terrible mistake with the character of Ferris. I know he's suppose to be the antagonist, but as played by Higgins, he was far too cartoonish to be taken seriously. I figure this was done purposefully, to perhaps have some comic foil in what is essentially a family-geared film. However, I couldn't take Ferris seriously enough to think he could shut down the park, nor could I take him seriously in thinking he was an actual official. This is where I would have advised Crowe to pull back a bit, make Ferris more of a stickler for rules but to make him less ridiculous and more sympathetic, someone who is just doing his job and not so obviously an idiot or an insensitive man. There were other things in We Bought A Zoo that made me resist its efforts to charm me. Besides the "finding money in the most unexpected place at the exact right time" business and the "Ferris the Menace" business, we have standard film fare: the angry and neglected son, the cute little girl, the male and female finally coming together, and the overt symbolism of an old tiger that has to be put to sleep (and the widower who fights so passionately against the reality of it). I wonder how the last two relate...Such symbolism is a touch too heavy for my tastes, and I'm not fond of things being so overt. I have nothing against symbolism, or even overtness, but about heavy-handedness, I do. The efforts of comedy (primarily from Macfayden's MacCready) never really worked because Crowe never allowed almost any of his characters to be anything but stock figures and cliches rather than real people with real flaws, real hurts. Still, I don't think there was anything particularly awful in We Bought A Zoo. Damon was acceptable, though whenever he fought with his son one could tell he was reaching for something that didn't quite make it. Johansson is an actress who frankly hasn't been given enough credit. Too often I think people dismiss her actual acting abilities simply because she is so beautiful. Granted, she hasn't always done good work (The Spirit, The Island--although the latter is one of my guilty pleasures, while the former is just hideous) but in We Bought A Zoo, she was sympathetic and believable as an efficient zookeeper. Church was there to be the Bonnie Hunt-type character (the wisecracking, disapproving older sibling Hunt perfected--and should have been nominated as Best Supporting Actress for--in another Crowe film, Jerry Maguire). If Cameron Crowe ever made a mash-up, these two would make a great comedic team in giving one-liners to all the proceedings. I think I've already gone over how Macfayden and Higgins were too silly to be believed and I found their parts to be distracting. On the whole, We Bought A Zoo is simply meant to be a sweet little film with a cross of indie and intelligent songs (always a Crowe signature) that is meant to make us cheer and raise our spirits. I won't begrudge them that. The fact that it didn't have that power to move me in the way it wanted to is something I won't begrudge either. Is it a cutesy little film? Yes. Is it a good film? It's passable. We Bought A Zoo...but we didn't quite buy the premise (even if it is based on reality).